1 Heat large nonstick skillet over medium-high heat. Add vegetables, onion and 1 Tbsp. (15 mL) Hellmann’s® with Avocado Oil with a Hint of Lime and cook, stirring occasionally, until vegetables are almost tender, about 5 minutes. 2 Meanwhile, whisk eggs, remaining 3 Tbsp. (45 mL) Mayonnaise, cilantro, cheese and salt in medium bowl. 3 Add egg mixture to skillet and cook over low heat, lifting set edges of frittata with spatula and tilting pan to allow uncooked mixture to flow to bottom. Cover and cook until frittata is set, about 8 minutes. 4 Meanwhile, whisk olive oil with vinegar in large bowl. Add salad greens, cucumber and cherry tomatoes and toss. 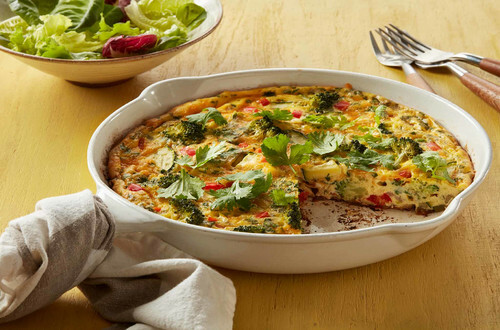 Serve with frittata and bread.